Successfully Added 10pcs+ Breathalyzer Alcohol Tester With LCD Display to your Shopping Cart. Box of 10 breathalyzer alcohol testers With LCD display. Low priced BAC Breathalyzer tester for those late nights out drinking, so you reliably test yourself before the police do it for you. 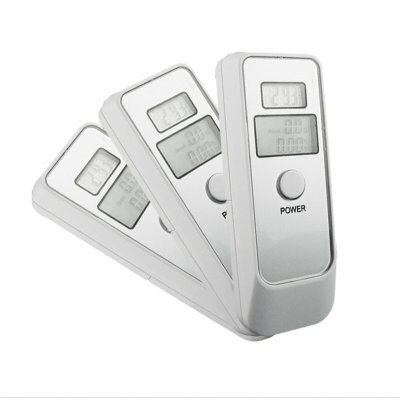 This wholesale deal accurately displays BAC and g/l, and will also tell what the time is on the dual LCD Displays. Testing is a simple process as you simply need to blow for 5 seconds and you will get the results. Understanding the results are also incredibly easy because there are audio and visual warnings for Caution and Danger levels of BAC. Finally, you have a real time Clock and a Countdown Timer added in. We now offer this item as a boxed quantity of 10 pieces in order to give you the absolute best resale profit margin from our low sale price and even better shipping rates. Brought to you by the leader in wholesale direct from China Electronics, Chinavasion. Note: The result of this test gives BAC for reference only. Chinavasion does not take any legal responsibility.. If you wish to make comments or reviews about this product, login and use the product review box. Please open a support ticket if you have questions regarding this product.